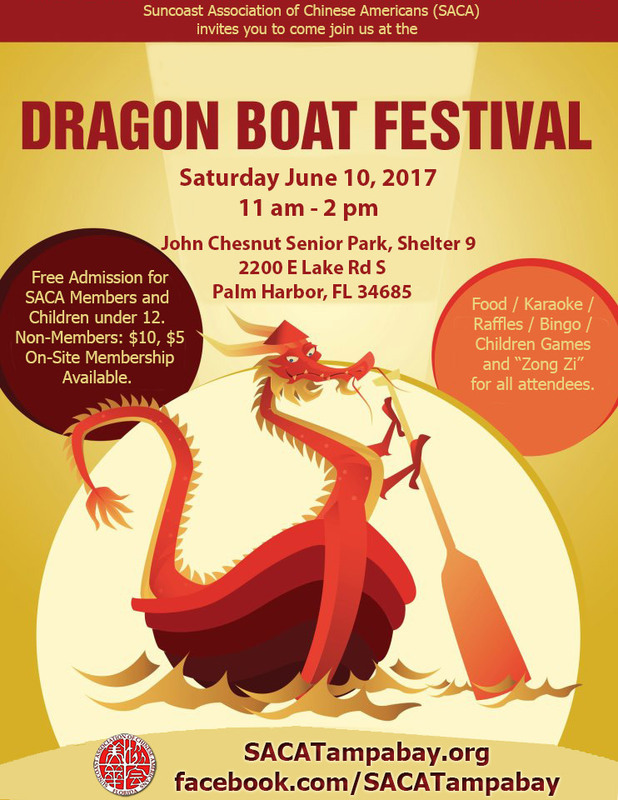 Come celebrate Dragon Boat Festival with us on Saturday June 10, 2017 (11 am to 2 pm) at John Chesnut Sr. Park, Shelter 9 (2200 E Lake Rd S, Palm Harbor, FL 34685). There will be food / karaoke / raffles / bingo / children games and “Zong Zi” for all attendees. Free admission for SACA members and children under 12. 30 Minutes before the event (10:30 am), there will be a nature trail walk at the park. This flora and fauna excursion will be lead by Randy or Fred. Please get there early if you want to join the adventure. SACA will provide food / drinks / deserts at the festival. However, with so many great cooks in Tampa Bay, we want to encourage all master chefs to bring their favorite Chinese dish / desert to share with everyone. This is pure optional / voluntary. If food is not your forte, please invite a friend or friends. SACA is looking for a “few good men / women” to serve as board of directors for the coming year. Contact one of board of directors if you are interested to serve the Chinese community in Tampa Bay. “Zong Zi” will be provided to all festival attendees. This year, Pat Fung and Dr. William Eng has teamed up to lead this project. With a team of hard working volunteers, Pat and Bill will deliver some tasty, home-made “zong zi” to everyone! Come and catch up with some old friends or better yet, meet and make some new friends.